Because trying to decide on the right twin stroller can be as involved as buying a car, we have created this helpful Twin Stroller Guide. 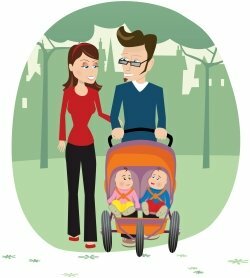 Having a good stroller can greatly improve the ease of getting your babies or toddlers out and about . They come in a wide range of prices with assorted features. 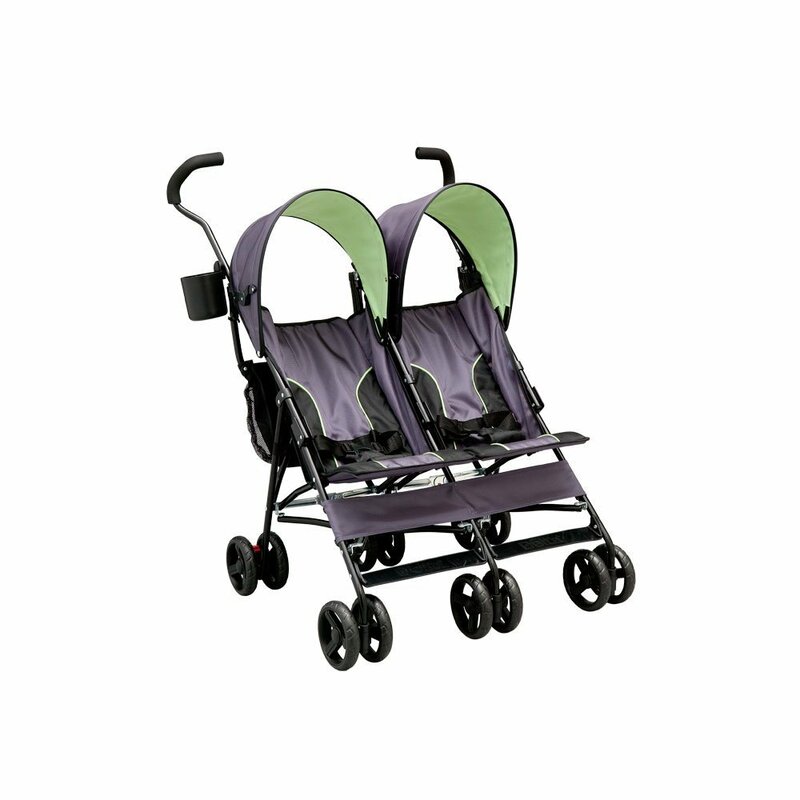 That said, we will review the two basic types of double strollers and the pros and cons of each. 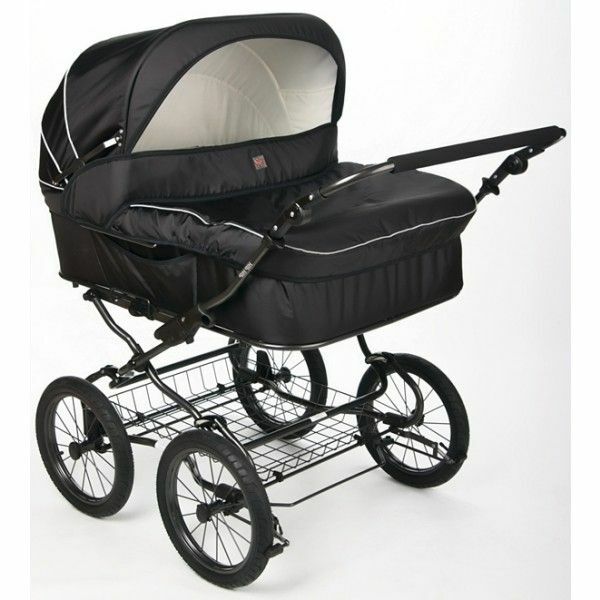 We also have sections on twin jogging strollers, twin prams and other unique options which are each in a class of their own. Just scroll down to read more and find out where to purchase. *Please note that while we try to keep this page up to date, the stroller models and pricing often change. This is only a guide. 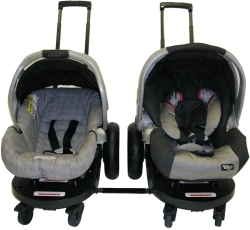 The first type of double stroller is commonly referred to as tandem (front to back). The seats are configured one behind the other and are essentially as narrow as a single stroller, although double the length. They also come in a stadium style arrangement where the back seat is slightly higher than the front. Will fit through all standard doorways. Many models will accommodate two infant car seats. A great help during the early months and perhaps their best feature. Most have cup holders and/or small cubby compartments on top and large storage baskets underneath. A few models have the option of arranging the seats backwards or facing each other. Most have separate trays in front of each child which can sometimes be removed if preferable. This offers the benefit of each child having their own space. They tend to be a bit heavier than side-by sides. Only the back seat reclines fully. Some children will not like sitting in the back seat, as it hinders their view. It is a little harder to keep an eye on the child in the front seat. There are a few models to choose from in an array of colors from this popular manufacturer. 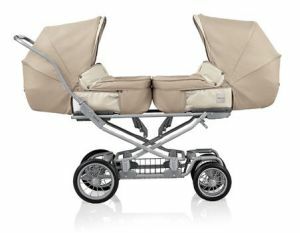 Shown in the video above is their famous Graco DuoGlider Double Stroller. it's one of the best all-around tandem strollers for the price. It features stadium style seating, giving the child in back a better view. With a well-designed fold-up mechanism, extra large storage basket, and the ability to hold two infant car seats at the same time (Graco SnugRide with EPS or Graco SafeSeat), it is ideal for twins. Not to mention it's reasonably priced at under $200. Newer on the scene for Graco is their Modes Duo Stroller which offers a whopping 27 different seating options! It's almost double the price of the Duo Glider, but you may fall in love with all of those options. It has the word "options" in it for a reason. The versatile Kolcraft Contours Options Tandem Stroller(pictured right) and the Kolcraft Contours® Options® II have several unique seating options that you won't find with other double strollers: Both children face parent - Children face each other - Children face forward - Children back to back. It will accommodate a variety of infant car seats with an adapter (one is included with an additional adapter sold separately). This stroller is designed to be more compact, and fit into a trunk when folded. Although the seats are designed to accommodate a toddler up to 40 lbs, taller children may not fit as well. It has a mid-range price of around $275. If you are looking for the finest in tandem strollers, check out the beast pictured right. It's a tandem double stroller with triple-passenger potential (it has a patented Stand On 'runner' for your toddler to ride on while you push, as well as a rear facing seat at the back). Some might call this the ultimate tandem twin stroller! 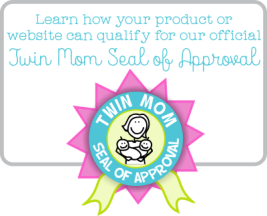 It's made specifically for families who are on the go and have twins plus one. The overall design and sturdy construction of the Joovy Big Caboose emphasizes functionality and durability, utilizing a steel and aluminum frame that folds up into a nice slim package for storage or transportation. There is a gigantic storage basket underneath. The two seats are compatible with a wide range of infant car seats as well. However, it is pretty heavy with a substantial price of around $350.00. The second type of double stroller is usually called a "side-by-side". Both children face forward and sit directly next to each other. They are wider, of course, than a tandem, but essentially the same length as a single stroller from front to back. Each child has the same view. Somewhat less bulky or heavy as a tandem. May not fit through all doorways. Are a bit harder to maneuver in tight spaces. Will not accommodate two infant car seats. May cause issues with bickering children. If you want a light weight, compact, affordable, double stroller, the Delta LX model may be a good choice. This stroller weighs under 25 lbs., has dual reclining seats, and two storage bags on the back. One helpful feature is that it will fit through a standard 30" wide doorway. It's probably not ideal for extra long trips, as it lacks storage space and other comforts. However, it will still get you out and about with ease for under $100.00. This sleek looking stroller for twins is lightweight, can be steered with just one hand, and has independently adjustable seats. Add the extra storage and handy cup holders and you're on your way to a comfortable outing. It too will fit through standard doorways and the narrower front wheel base makes it much easier to steer. It's definitely a step up from the cheaper Delta brand, but you will pay over $200 for this guy. Of all of the side by side models, this is definitely a favorite. You won't believe all of the color combinations that this model is available in. But better yet, it's only about 10 pounds, making it the lightest weight model we have come across. It features quick one-hand collapse, huge folding canopies, cup holders, and storage pockets. Another great feature is that the wheels on this puppy are guaranteed for the lifetime of the product. Zoe will fix or replace your wheels if they ever break! For a little over $200 bucks you can own one of these. 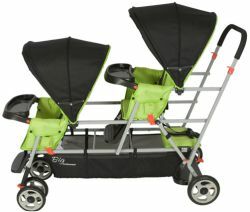 If you plan on power walking or jogging with your twins you will definitely want to consider a double jogging stroller. These strollers are a bit more rugged than your traditional tandem or side-by-side. They are generally more expensive too. You will find that they have quite different features as well. 1) A fixed front wheel. 2) A swivel front wheel (or wheels). We will briefly discuss the differences between the two. 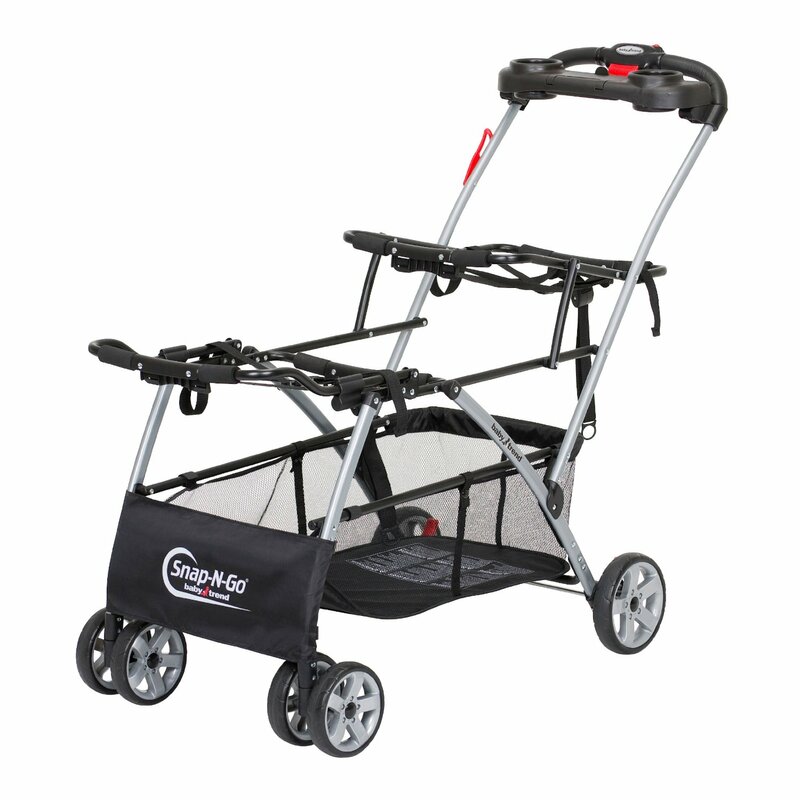 This type of stroller offers the stability needed for heavy jogging or running over numerous types of terrain. The larger, fixed front wheel provides straight tracking and better handling over bumps. The wheels are actually more like bicycle tires which make for a more comfortable ride at any speed. There are also several available features to take into account when choosing the most suitable model. Options like shock absorbers and change out to a bike trailer are just a couple of aspects. 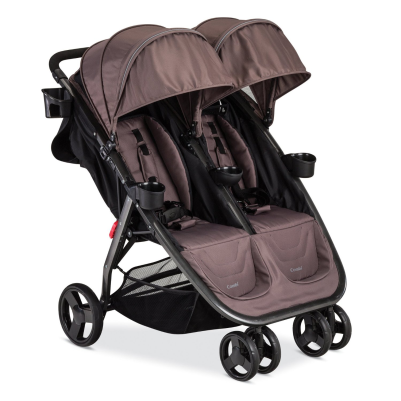 If you plan on using your stroller for light jogging, power walking, and the mall, then this might be a good choice. The front wheel or wheels are commonly smaller than the fixed models and almost always air filled. They might not track as straight or go over bumps as easily, but they are much more maneuverable. And, of course, they have several additional features to choose from, like adjustable handlebar, and narrow profile. 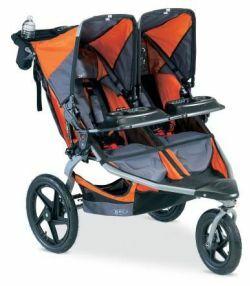 I have come across a twin jogging stroller that actually incorporates both types of wheels. 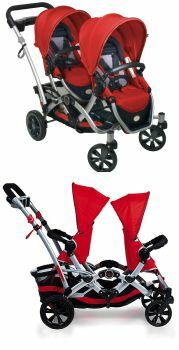 The BOB Revolution Duallie Double Stroller provides a fully rotating, 12-inch front swivel wheel that locks into a fixed position for better control while jogging. But don't forget the hefty sticker price of about $500. The use of a pram has been common in the UK since the Victorian era. The word pram is actually the shortened version of the word perambulator. In North America an English a pram is known as a baby carriage. Modern prams basically consist of a carrycot or bassinet (sometimes detachable) where the infant lays down facing the pusher. Twin prams are large and expensive, but oh so posh! You can really only use a twin pram during infancy or until your babies are sitting up. However, they are a wonderful, old-fashioned way to go for a stroll. Most of the new twin prams offer interchangeable seats and/or configurations for growing babies. This is a unique travel system designed for birth through toddlerhood. This ingenious mom-invented product turns your child's car seat into a mini stroller. Made for everyday cruising, it's especially handy when traveling with twins. You need to purchase the special "twin adapter" (sold separately) which will connect two Cruizers together (shown above). They can easily be detached at any time for storage or toting in different directions (Think, dad goes one way and mom goes the other) and each unit weighs only 12 pounds. Compatible with many of the most popular infant car seats as well as toddler seats (requires a toddler seat adapter - sold separately), it will hold up to the same weight as your car seat (not included). You can pick one of these versatile Cruizers up for around $150, but will have to purchase an extra one as well as the adapter to accomodate twins. A smart investment when you consider the freedom and flexibility it offers parents with particular needs. Yet another versatile option for those with twins or twins and a toddler is the Kiddy Board Maxi and Buggy Board pictured here. These innovative little boards snap easily on and off the backside of your stroller and just as easily stores in the stroller basket when not in use. 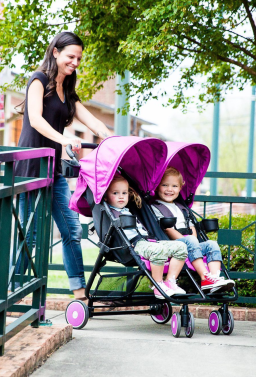 Gives your older toddler a place to ride when strolling with your twin babies without the bulk of a triple stroller. Or, use the Kiddy Board on a single stroller for older twins...One can sit in front while the other stands behind (a truly compact option)! This item runs around $79. For parents with infant twins looking for a frugal option, the Baby Trend Double Snap N' Go Stroller may be a good choice at only about $100. It will easily accommodate two infant car seats on the carriage frame. It's a convenient alternative to a conventional carriage or twin stroller because it fits most major brand car seats, folds compactly for storage or travel with one hand fold and features and extra large storage basket. Keep in mind though, this type of stroller will only last as long as your twins fit into their infant seats (approximately 1 year).